Northowram lead Division One of the Halifax AFL on goal difference from three other sides after completing an early-season double over Plummet Line with a 7-0 home win. They took a 5-0 lead up the slope in the first half and only a series of bad misses kept the score line in single figures. A reaction save from James Bunn prevented an early Plummet goal but the goalmouth action was at the other end. Chris Gent hit the bar and Karl Amos was denied by a smart save before Matt Calland scored with a cushioned volley from Craig Collins’ cross. Calland then doubled the lead with a beautifully-struck shot from distance. Plummet missed a good chance and the game turned into a very one-sided affair with three goals in the last seven minutes of the half - an own goal and others from Collins and Josh Baines. Two goals in five minutes from Baines midway through the second half completed the scoring. Illingworth St Mary’s blitzed Salem 8-0 with the help of a hat-trick from Joe Griffin. Luke Prosser added two and debutant Marc Loboda capped a man of the match performance with the opening goal. A Phil Livsey tap-in and an own goal rounded off the scoring. It could have been much more but Saints were guilty of some poor finishing and there were some outstanding saves from the Salem keeper. Salem deserved great credit for battling throughout but could not find a way past a Saints defence in which Livsey and Jordan Wadsworth were outstanding. St Columba’s recovered from a two-goal deficit to pick up their third victory of the season with a 4-2 win away at the Sun Inn. Sun Inn took the lead when Ryan Barkham’s pinpoint long ball split the Saints defence. The second came after a surging run by the Sun Inn left back and the debutant striker scored from his cross. Despite the score line Saints were a constant threat and they pulled one back from range through right winger Andy Sandells. The sides were level at half time, Ben Caldwell converting from the spot after George Cook was brought down. Saints took the lead with 20 minutes remaining when the excellent James Stansfield curled a free kick into the bottom corner. The game was killed off with five minutes remaining when Ryan O’Neill ran on to a defensive clearance and volleyed in from 25 yards. Brighouse Sports are the other members of the leading quartet after they stunned a Mixenden side who had won their opening two games with a 4-1 win at Lightcliffe Academy. Connor Durkin, Harrison Hines, Ben Oakland and Josh Robinson struck for Brighouse while Danny Kirman, Gareth Sherwood and Anthony Bowman helped Holmfield beat Elland Allstars 3-0 at Natty Lane. AFC Crossley’s and Greetland Reserves already have a five-point advantage at the top of Division Two after winning for the fourth time this season on Saturday. Crossley’s look much-improved and Tom McGregor struck twice in their 4-0 win away to Calder ‘76 Reserves at Luddenden Foot. Greetland Reserves, who have played a game more, beat visitors and previously-unbeaten Sowerby Bridge Reserves with the help of a couple of goals from Andy Hurcombe. Another two-goal man was Sowerby United Reserves’ James Stott, who helped his side get the better of Northowram Reserves 3-2. 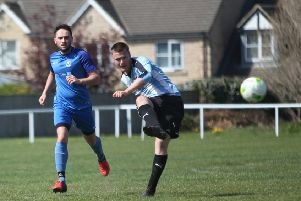 Shelf United Reserves’ Ross Broadley scored his fourth and fifth goals of the season as his side turned a 3-1 interval lead into a 4-3 success against Stainland United at Stainland Rec. Midgley United Reserves got off the mark for the campaign with a 3-0 home win over Illingworth St Mary’s Reserves, Darren Nelson, George Standring and Richard Vile finding the target. Top of the table Shelf FC Reserves beat bottom side Hebden Royd Red Star 2-1 in Division Three at White Lee Rec. Shelf started the brighter and took an early lead through Ben King, whose shot from 30 yards settled in the bottom corner of the goal. Hebden got themselves back into the game when they capitalised on a defensive error but Shelf regained the lead 10 minutes before the break through Kyle Peel who slotted the ball past the advancing keeper. Neither club had a first team game and Hebden utilised their strong squad, making changes. They were the better team in the second 45 minutes and hit the bar as well as bringing several smart saves from Matt Riches but Shelf held out. Flying Dutchman broke their duck at the second attempt this season with Daniel Murgatroyd (2) and Callum Kenny scoring in a 3-1 win against Warley Rangers at Savile Park. Ssubstitute Charlie Andrew replied. Spectators at Mason Green were in danger of losing count as Elland United beat AFC Crossley’s Reserves 13-1, Dale Cartwright giving the hosts their one moment of satisfaction.